I was fortunate to grow up in the Rockies and ski in Aspen, but in the fall of 2013, I was craving more exciting terrain and better snow. I took a road trip with friends through Utah, Wyoming and up into Canada, and by the end of the trip, nothing came close to my weekend in Jackson Hole. One year later I had a pass and a new mountain to call home. There is plenty of terrain for all levels at Jackson Hole Mountain Resort, but if you’re like me and searching for the best airs, deep snow and tight couloirs, come check out a few of my favorite zones. I moved to Jackson, Wyoming, for the amazing inbounds ski terrain at Jackson Hole Mountain Resort. The resort, which averages over 450 inches of snow, offers fast groomers, open bowls and – most importantly to me – tons of chutes and cliffs to jump off. My favorite way to start the day is to head straight to the tram. In less than nine minutes, you’ll find yourself standing 4,139 vertical feet at the top of the mountain. Before clicking in, I like to stop at Corbet’s Cabin and grab a delicious waffle. Even if you don’t plan on skiing down from the tram, you should still go up for the amazing views of the Grand Tetons, Cody Peak and the valley below. For a good warm-up run, I head to Rendezvous Bowl for some high-speed turns down to my favorite lift-accessed chutes. The Alta chutes sit below the summit and can be accessed by the Sublette chair. The chutes face north and the trees offer protection from the wind and sun, keeping the snow and skiing great for days. My favorite zone is Alta Zero, which is littered with cliffs and mandatory airs, but it can be closed during the season. When it’s open, it’s game on and is one of my go-to spots on a powder day. If not, the other Alta chutes are great for skiing, with lots of cliffs to jump off and fun steep tree skiing. Accessed by a short 5 to 10 minute hike from either the top of the gondola or from the Tensleep Traverse, Headwall, Casper Bowl and the Crags offer a variety of advanced terrain. Here you’ll have options for both open powder fields (Headwall) or cliffed areas (Casper Bowl and the Crags). My favorite of the three is Casper Bowl, with its many cliffs to jump off and tight chutes to ski through. Even if that’s not your thing, Casper Bowl offers many ways through without airing and offers some seriously fun deep-powder turns. The wind tends to fill Casper Bowl with more snow than the rest of the mountain, so it’s always a great spot on a powder day. If you’re looking for some good untracked powder a few days after a storm, head all the way out to the Crags. They’re a little further up the sidestep on skis, but many people get suckered into dropping in early, so the snow stays fresh much longer. Named one of the best ski runs in America by Men’s Journal, Corbet’s Couloir is on many expert skiers’ bucket list. The couloir cuts through the steep cliffs from the summit and taunts skiers during the tram ride. The overhanging cornice and mandatory drop to get into the couloir keep most people from ever attempting it. Even though it looks like you will instantly catch an edge and tomahawk all the way down, it's actually quite doable, conditions permitting. It definitely takes some skill, so make sure you're capable of skiing steep double black terrain before attempting it and, more importantly, wait for some new snow. While my favorite way into Corbet's is to backflip off the nose of the cornice, I don't recommend that for your first drop into the couloir! When you're ready and the snow is soft, head to Corbet's from the top of the tram and watch a few people drop in first to see how they do it. The key is to approach the edge slowly and locate the goat path, which is the easiest way in and where everyone will be standing. Slide as far as you can into the couloir sideways without losing your edge so you don't come in with too much speed. Slowly creep your skies down sideways until you can see the path headed under the cornice to the skiers' right. Once you get down low enough and you can see the turn, slowly rotate your tips downhill and into the couloir. This is where most people go wrong - they lean back and turn uphill as soon as possible, trying to stop, but that puts their weight on the tails of their skis and they lose control, sliding the whole way down on their back. To avoid that, as soon as you drop in, keep your weight forward and over the front of your boots and instead of trying to stop right away, make the right turn toward the wall and then turn left, using that turn to slow down and regain control. That’s it; now you’re in and you get to enjoy the soft snow that so many people will never get to ski. After you master Corbet’s, the next step is S&S Couloir, looker’s left of Corbet’s, which offers a much more exhilarating entrance with a mandatory cliff drop into a much skinnier couloir. After mastering the inbounds terrain, you can hire a guide to check out some of the best lift-accessed backcountry in the U.S. If you want to get an even better look at Jackson Hole’s legendary terrain and some of my favorite runs, check out my most recent video. 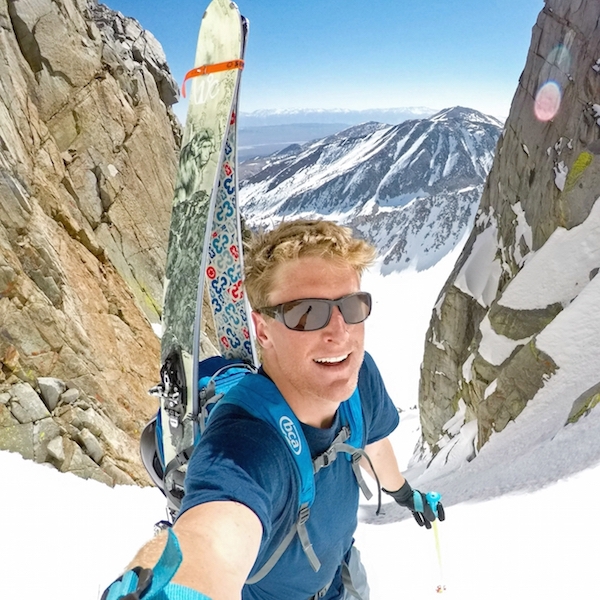 Born in Aspen, Colorado, Owen donned his first pair of skis at the age of 4 and has loved skiing ever since. He grew up skiing in Aspen and Telluride before attending the University of Colorado. Following graduation, Owen moved back to Aspen to pursue skiing as a career in slopestyle and halfpipe. Looking to move somewhere new, Owen discovered Jackson, Wyoming, where he now lives. You can find Owen skiing at Jackson Hole Mountain Resort, in the backcountry and in the Tetons year-round, documenting his many adventures through photos and videos.